Maureen is the current Program Coordinator at Women in Management and Business (WIMBIZ), a Nigerian organization that seeks to elevate the profile and influence of women in management and business and to encourage and facilitate the interaction between women corporate executives and entrepreneurs. WIMBIZ is a member of the Africa Businesswomen’s Network (ABWN), a partnership between local African businesswomen’s associations, Vital Voices Global Partnership, and the ExxonMobil Women’s Economic Opportunity Initiative. As the Organization of Choice for African Women in Business, the ABWN works to accelerate economic growth for women, in order to improve the quality of life on the continent. At WIMBIZ, Maureen manages and oversees the development and implementation of the mentoring program. Her main assignments include screening, assigning, monitoring the relationship with mentor and mentee, and ensuring program quality and performance. Maureen’s knowledge and experience working at WIMBIZ encouraged her to enter the yearly Moremi Initiative Leadership and Empowerment Development (MILEAD) competition to study how mentoring is done elsewhere. From 25 countries across Africa and in the Diaspora, the 2011 edition of MILEAD picked projects that breached topics, such as: poverty alleviation, women’s economic empowerment, global warming and women’s participation in politics. 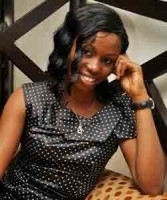 Only 25, Maureen was the first female candidate from Nigeria. Selected alongside 25 others from different African countries, Maureen travelled to Accra, Ghana for a-three-week leadership training program to be carried out by the Institute of African Studies at the University of Ghana, Legon. Yes this month a panel of judges will choose a winner and runner-up in each of the four categories, and we are having a celebratory event on 27th October in London where the winners will be announced. Please email louseley@oneworldaction.org if you would like more information! Thank You to Sarah for nominating you, to One World Action for recognizing young African women achievers and to the Women In Business and Management (wwww.WIMBIZ.org) for developing young talent.